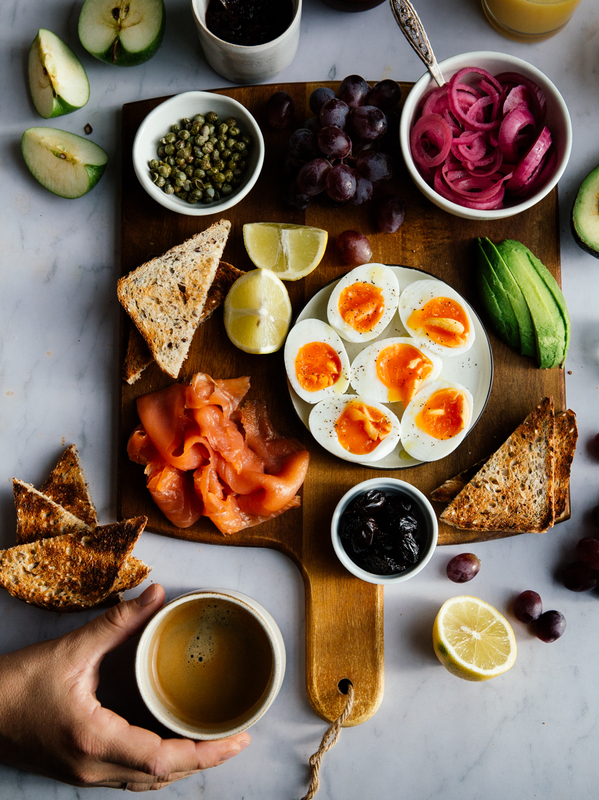 This breakfast platter with pickled onions and smoked salmon is one of my favourite things to wake up to on a lazy weekend. 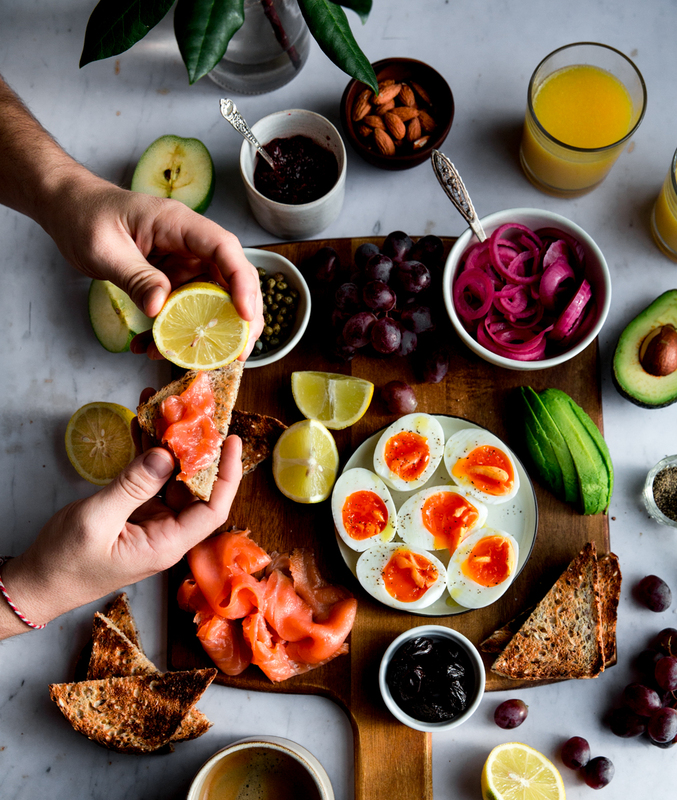 I love breakfast every day of the week; I usually wake up quite early, between 7 and 7.30, and after painstakingly following my morning routine, I start preparing breakfast. It may be just yogurt with homemade granola or honeyed fruit, overnight oats or pipping hot oatmeal; oftentimes it’s eggs on toast, alongside the obligatory avocado slices, almost buried under crunchy dukkah or sumac. Or it can be slices of seeded bread, with thick tahini, fruit and sweet Greek honey. Whatever it is, it’s never the same and I devour it with enthusiasm almost without fail. The joy of breakfast is never lost on me, regardless of the day ahead- or, often, because of the day ahead; see, regardless of what needs to be done after, however daunting, tedious or exciting, breakfast is like a guaranteed gift, a half hour that promises- and delivers- comfort, peacefulness, even excitement first thing in the morning. And on the weekends, when I also wake up early, but usually with fewer mundane things to follow, breakfast becomes a somewhat bigger celebration. There’s more things to prepare and plate and enjoy and this here is often my go-to selection of favourite savoury things: quick pickled onions with lots of spices, 6′ eggs with bright soft yolks, black olives and capers from Oliveology, fresh fruit and vegetables and lots of crunchy bread. It’s simple, colourful, satisfying and hits almost every note. And it’s good enough to linger over for the better part of a Saturday or Sunday morning. 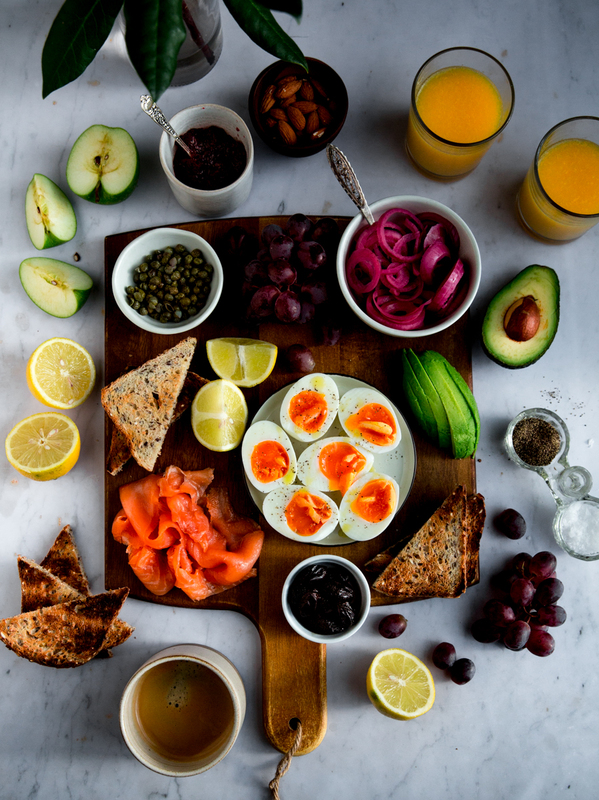 to serve: smoked salmon, black olives, capers, four 6′ eggs (see how to make them here), lemon wedges and plenty of toast. Add all the ingredients, apart from the sliced onions, in a medium saucepan over medium heat and simmer for about 2′. Remove from the heat and set aside. Place the onions in a colander and pour plenty of hot water to soften them. Drain well and then place into a sterilised jar. Pour over the vinegar mixture and close the lid. Allow it to cool for a couple hours. Keep in the fridge for up to a month.